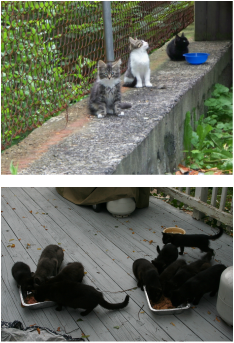 Feral cats are domesticated animals that have had to learn to survive on their own. Born outside, they have had little to no human contact and have become so fearful of humans that most are not adoptable. Feral cats are not “wild animals,” so nature did not provide them with the proper adaptations to survive winters in the Northeast. Without a regular food source and some kind of shelter they rarely live more than two winters and that’s if they survive the cars, coyotes and other predators. Wild animals, like raccoons, have been provided with what they need to survive. Humans domesticated the cat and then through irresponsible behavior thoughtless people send them out to fend for themselves. We, at Better Days, feel it is our job to help them the best that we can and to educate people in order to stop the needless suffering of homeless and feral cats. Often, the most we can do is spay and neuter the members of the colony in order to prevent the birth of more kittens that will follow the fate of their parents. We do this through a humane program called “Trap Neuter Release” or “TNR”. Cats are carefully trapped, given a medical exam, vaccinations and spay/neuter. They are then released back to the colony to live out their lives the best they can. In most cases the colonies are being fed by local residents to whom we supply food whenever funding allows. We also supply feral cat houses to protect them from the harsh winters. We maintain the health of our colonies and re-trap any sick or injured cats that need to be brought back to the vet for care. They get time to heal in our homes before being returned to the colony. We also trap any newcomers and drop-offs to prevent pregnancy. If we miss one and there is a litter of kittens we do our best to get them early enough so that they are friendly and can be put up for adoption.